In January, it was the mass hunger strikes on Manus Island that challenged the offshore processing regime. Now Nauru has become the latest flashpoint of resistance. Around 400 refugees on Nauru have embarked on a campaign of non-cooperation with Australia’s detention regime and the Nauruan government. The campaign was launched following a state reception for Australian Immigration Minister, Peter Dutton, on 26 February. Dutton announced another five years’ funding for the Nauru detention regime. The Nauruan government eagerly grasped the money, but for the refugees it signalled another five years’ imprisonment on the island, robbed of their future. Although recognised as refugees needing international protection, all they are offered is hell and uncertainty for them and their families. The discrimination is compounded by the fact that asylum seekers were arbitrarily selected when they arrived in Australia to be transferred to Nauru and Manus Island. Those who stayed on Christmas Island have now been released into the Australian community and will be eligible for temporary protection visas. Those on Nauru have suffered up to 20 months of horrendous conditions. “We were no longer willing to co-operate with the detention regime on Nauru. It was like Australia and Nauru were treating us as slaves who be transported across the Pacific and ‘sold’ to Nauru,” one refugee told Solidarity. Children were withdrawn from school; refugee adults boycotted English classes; refugees refused to attend interviews with case managers; and around 150 withdrew from their jobs. On Friday 27 February, around 300 staged their first peaceful protest. When the rally attempted to march along Nauru’s main road, the police blocked the road, and a number of refugees were punched and knocked to the ground to prevent the march proceeding. The refugees responded with a call to the Nauruan people to support their fight against the cruelty of the Australian government and the collaboration of the Nauruan government. They called a protest for 4 March, and made it clear their protests are not directed at ordinary Nauruans. But since the mass protests, tensions have mounted. 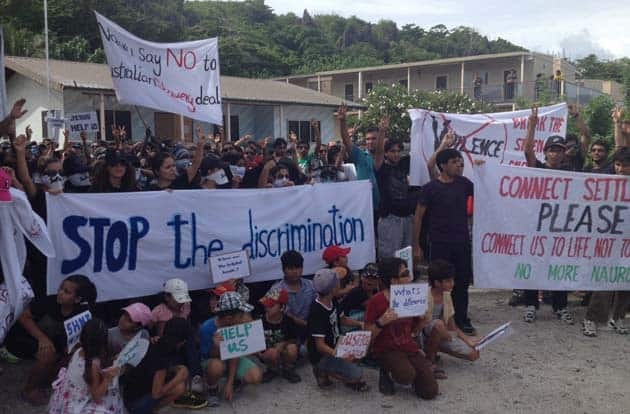 The Nauru government first issued decrees banning asylum seekers and refugees from certain areas; now they have circulated notices threatening up to three years’ jail for protesting. On 4 March, the police carried out pre-emptive raids; arresting families including a seven year-old at 4am. Police were stationed at the gates of the family compound and began arresting refugees who left the compound to shop. Refugees gathered to protest the arbitrary arrests. But as they tried to walk to the police station to call for the release of those arrested, police swooped—arresting and jailing 183 people including children over that day. While the children were taken out of the jail by case managers that night, some adults spent 48 hours in jail and all of them went 24 hours without food. Muslim women were stripped of their head coverings and some were forced to strip entirely. The mass arrests have encouraged a minority of Nauruans to step up their vigilante attacks on refugees. Groups of up to 25 have stoned refugee compounds. There are growing cases of harassment. Some shops have stopped selling rice to refugees; others refuse to sell alcoholic drinks and there also seems to be a ban on selling tools like saws or screwdrivers. In November, one refugee was blinded in one eye by stone throwing Nauruans. In March, an Iranian couple were seriously injured when their motorbike crashed after a stone thrown by locals knocked the driver unconscious. Two days later, two masked men armed with a bat and a sword attacked a refugee on a motorbike right outside the family camp at Anabare. Other refugees drove the attackers off, although two suffered bruising from blows from the bat. But the refugees are undeterred. Chants of “No more Nauru,” and “Shutdown offshore,” ring out across the island. Since the mass arrests, hundreds of refugees have staged further peaceful protests. The Australian government says that refugees on Nauru have nothing to do with them; the Nauruan government says advocates are lying about what’s happening. So who is pulling the strings? One incident says it all. As Solidarity was going to press, the refugees met with a representative of the Nauruan government seeking permission to protest at the Australian immigration office or the Australian embassy. The Nauruan rep said she would raise the issue with the Australian government when she met them.